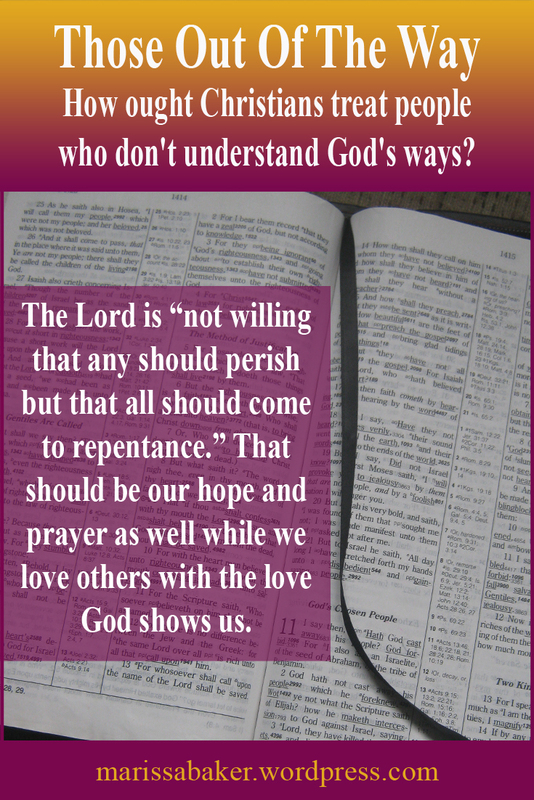 God never intended for His people to stand in condemnation on those who don’t understand His ways. Yes we’re to know the difference between right and wrong and urge people to repent of their sins and build a relationship with God, but we’re not to attack them. We have a command to judge ourselves and we’re given limited judgement within the church (e.g. not allowing someone who openly practices sin, in spite of their profession to follow Jesus, to fellowship in the church see 1 Cor. 5:1-13). But is not godly to belittle and criticism people. Instead, we should respect the potential God has placed within all humans. In his second epistle, Peter addresses those who think Jesus isn’t coming back because they don’t see indications of the world changing. Peter reminds them that the Day of the Lord is a “day of judgment and perdition of ungodly men” and God has a reason for not bringing it about yet (2 Pet. 3:1-8). God is reserving the world for a certain end, yet He’s also holding back the final judgement. It is His sincere desire that people would turn to Him and be saved. While we might think, “Just get this world over with and do-away with sin and sinners,” that’s not God’s attitude. The Father sent His Son into the world because He loves all men and doesn’t want any to loose their potential for eternal life. Jesus wasn’t sent “to condemn the world, but that the world through Him might be saved” (John 3:16-17). There will be people who refuse that gift, but not for lack of effort or desire on God’s part that they be rescued and redeemed. 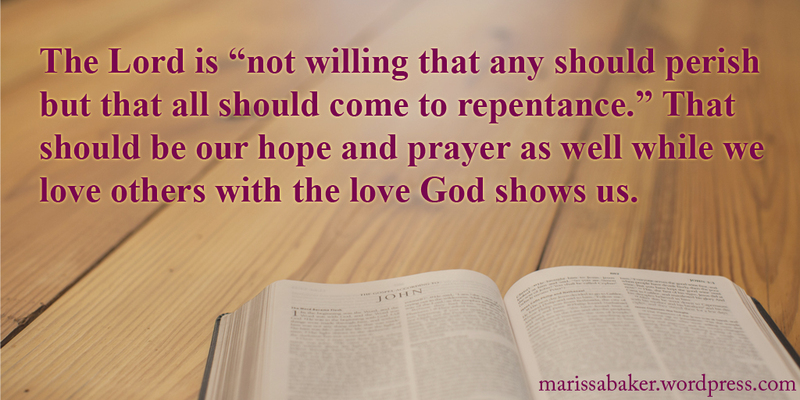 As children of God, our focus and desire should also be that all men come to repentance and don’t perish. Even as we pray, “Thy kingdom come,” we should also thank God for His mercy in holding out time for repentance. Our goal as Christians is to become like God and grow “to the measure of the stature of the fullness of Christ” (Eph. 4:13). We can hold fast and work towards that goal because we have Jesus as our High Priest, our helper, and our example. Jesus Christ — the only being who’s ever lived a sinless human life — has compassion on our weaknesses. He understands what it’s like to be tempted and even though He resisted all temptation, He doesn’t look down on us for falling short of His perfect example. Instead, He reaches down to help us. Like the human priests of old, we’re infirm, flawed, and prone to sin. 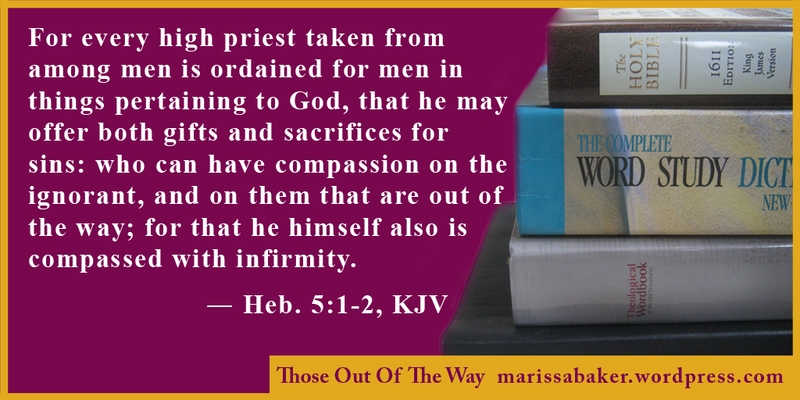 That fact should give us compassion for our fellow humans who are “going astray.” In the King James Version, that phrase is translated “them that are out of the way.” It refers to people who’ve wandered away from safety or truth. We’ve all done that. But instead of letting our first-hand experience make us sympathetic, we all too often fall into a trap of pride. Instead of remembering we were once sinners, we focus on our current righteousness. Instead of remembering that any righteousness we do have is a gift resulting from God washing our sins away in Jesus’ blood, we think we’re better than “those other people.” We forget that we “stand by faith” and should not be “haughty, but fear.” If we refuse to walk in God’s way of love, we can be removed from the Vine (Rom. 11:17-24). Human minds can’t understand the things of God unless He guides them by His spirit (1 Cor. 2:9-14). That fact should humble all who’ve been called into God’s family and give us compassion. We have no right to condemn or belittle whose who know less than us. And we must also be careful in assuming that we have more knowledge, for “if anyone thinks that he knows anything, he knows nothing yet as he ought to know” (1 Cor. 8:2). We don’t know what we’re missing any more than we can judge the depth of understanding other people have. It all boils down to what Christ called the second great commandment: “You shall love your neighbor as yourself” (Matt. 22:39). We’re meant to be kind and compassionate to all people in all circumstances. Agape love seeks the good of the other person, which can involve warning them away from wrong actions, but is never cruel. Treat others within and without the church as Jesus treats you, and you’ll be doing well.